The Tar Heels have had some good wins at Cameron Indoor Stadium, but lets see which ones top the list. The greatest rivalry in all of college sports will be renewed this Thursday night. 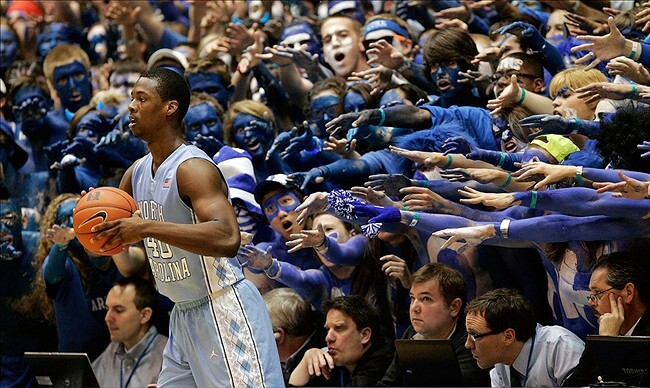 The Tar Heels will take that eight mile trip down the Tobacco Road to Duke, to take on the Blue Devils. 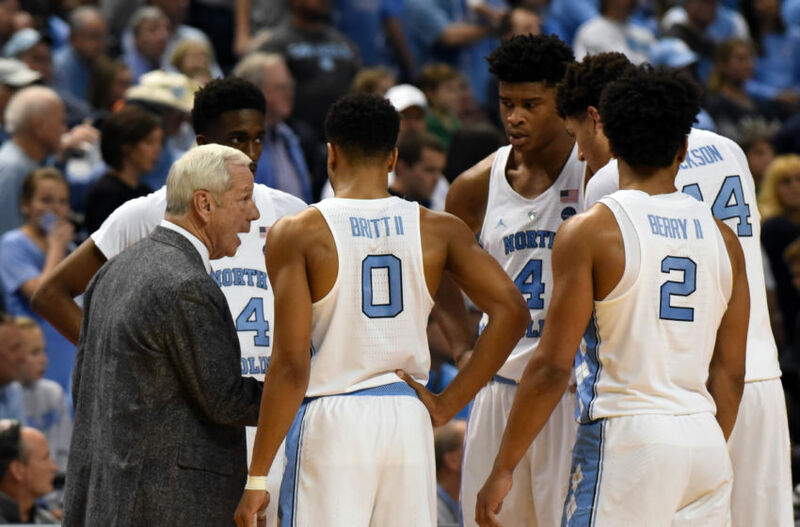 This chapter in the rivalry will undoubtedly be decided by how well the Heels can defend the three-point line, and if they can continue to dominate on the glass. While some fans may root for an all-time classic this Thursday, most fans will be rooting for an all time beat down. UNC’s largest margin of victory in this rivalry is 37 points, in a game all the way back in 1921. While that may be hard to beat, would it not be nice to see the Heels cruise to victory? In this list, there are some all-time classics, and one of the best beat downs in recent history. Here’s to hoping that Thursday will be much like the latter! Best Play: Tie. All three of these plays! 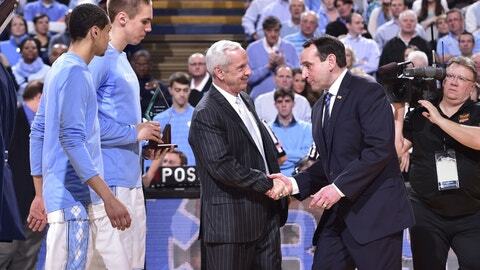 This game was a beat down of epic proportions, and it was a game that the Heels never trailed. But most people will likely remember the unfortunate ending of the previous matchup. After this game, Kendall Marshall was asked what motivated the guys to win the game by a large margin, and he said, “I told my teammates I thought that was disrespectful, and we need to go out here and prove a point.” As to what he was referring to there, Duke showed a video of Austin Rivers’ last second buzzer beater against the Heels, before the starting lineups. What made this game so good for the Heels is that they were locked in from beginning to end, and showed just how good they could be. All five starters scored in double figures, and three players came away with a double-double; Marshall, Henson, and Zeller. As a result of a victory, the Heels won the ACC regular season title. Any time you can get a win on your rival’s court, and lock down a conference title, it is a big night. This game was certainly one of the best wins in recent memory! This game was a breaking out of sorts for this Tar Heels team. They were one year removed from a national championship, and yet they were still a top-15 team in the nation. And of course, just a few years later, a UNC team led by Tyler Hansbrough would win a national title. This game was the start of a run for the Heels that featured four straight wins at Cameron Indoor. 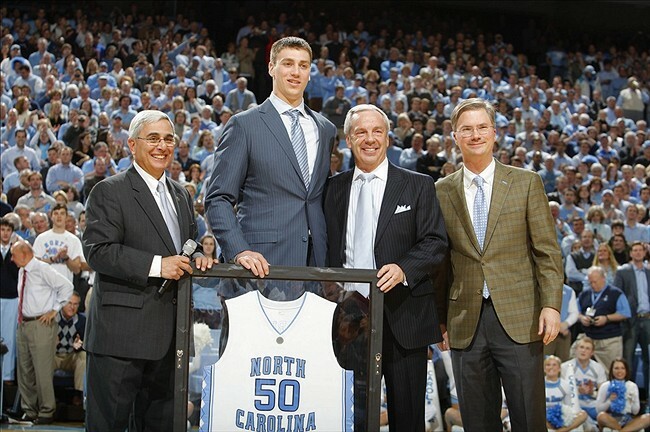 Many Tar Heels fans know, Tyler Hansbrough is an unprecedented 4-0 in Cameron. But perhaps neither one of those two things were the best part of that game. This game was J.J. Redick’s senior night, and it was ruined by a first-year player in Hansbrough. Reddick went 5-for-21 from the field that night, which made it even sweeter. It was great timing for the Heels to make their run. Tied at 59, the Heels went on an 11-0 run to lead 70-59. After that run, the Heels never trailed again. This game did not have any implications on the ACC race though. Duke had already locked up the top seed heading into the game. This game was the book end of Tyler Hansbrough’s phenomenal run at Cameron Indoor. But the final score is not indicative of how hard the Heels had to fight to win this ball game. As a matter of fact, at the half, the Heels trailed 52-44! But the second half was probably the best half of basketball that the future national champions played all season. The Heels made two runs, one was a 25-11 run, and the second was a 14-0 run that eventually put the game away. Ty Lawson had 21 points in the second half, which propelled the Heels into sole possession of first place in the ACC. But most impressively for Carolina, every single starter scored 14+ points that night. This game just goes to show you how great that UNC team was. At the time of this game, they were the first team to rack up triple digits against the Blue Devils in nine seasons! The 2017 Tar Heels team may not be as dominant as the 2009 team, but there is no reason they can not replicate the results of this game! This year’s team is high-scoring, and if Theo Pinson is back, the Heels have plenty of weapons to come away with a win. Recency bias may have something to do with this, but oh well. This win was big for Carolina in several ways. For starters, it locked up the program’s 30th regular season ACC title. Secondly, it halted a four-game Duke winning streak in the rivalry. 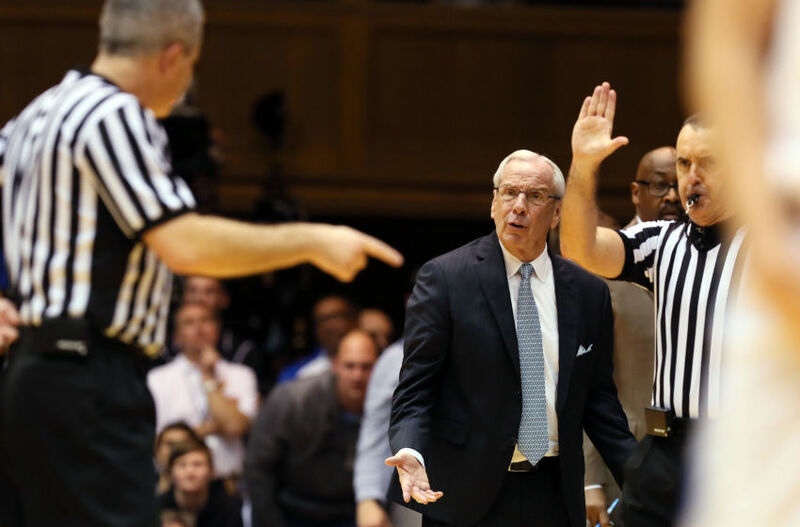 Number three, it was the Heels’ first win at Cameron Indoor in nearly four years. Lastly, it was sweet, sweet revenge for the game that the Blue Devils stole in Chapel Hill a few weeks earlier. While the final score was close, the Heels dominated nearly every facet of the game. Carolina never trailed in this game, after getting out to a quick 6-0 lead. And they won this game the same way they had won most of their games last season. They were DOMINANT in the paint. Carolina out-rebounded Duke 64-29 (! ), and were hard to stop in the paint, outscoring the Devils 42-20. 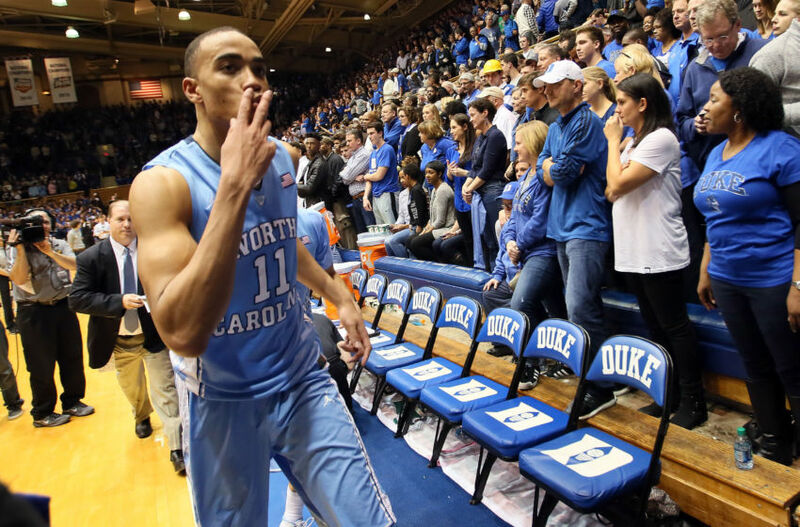 Brice Johnson almost out-rebounded Duke by himself, corralling 21 rebounds to go with his 18 points. Also, all five starters for Carolina racked up double-digits on their way to this big victory! This game was the second win of a ten game winning streak that carried the Heels all the way to the National Championship game. And of course, who could ever forget the awesome locker room celebration after the game! Play of the game- Well, just take your pick out of this montage. Breaking this game down further, it is a testament to this rivalry how this game was close. Every time these two teams take the court, no matter their ranking, you are most likely going to get a close game. North Carolina came into this game ranked No. 2 in the Country, and Duke came in winless in ACC play. Duke was missing head coach Mike Krzyzewski, and fill-in Pete Gaudet was floundering in his stead. The main highlights from this game include the MONSTROUS dunk from Jerry Stackhouse that is shown in every single UNC-Duke promo to this day. 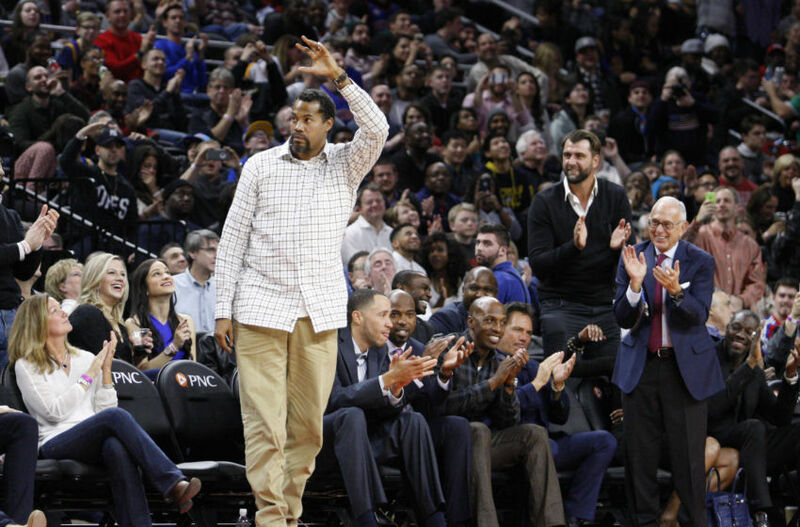 But also in this game was the memorable 35-foot buzzer beater from Jeff Capel that sent the game to a second overtime. (No, that shot did not win the game, contrary to popular belief.) The aforementioned buzzer beater is also shown in every single UNC-Duke promo you will see. It came down to the final play of double-overtime also. Steve Wojciechowski, now head coach at Marquette, missed a 15-footer with one second to go, and the second attempt was missed by Greg Newton. The Tar Heels snatched victory away from the Blue Devils in this game, but either way, the fans are the real winner for being able to watch this instant classic.